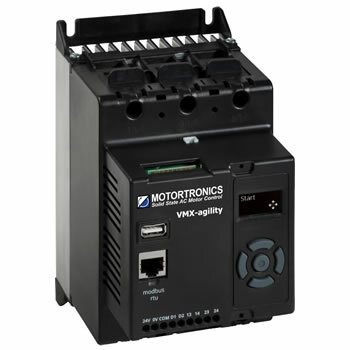 VMX-agility™ has been developed to exceed the exacting demands of industrial automation motor control clients. agility™ delivers stable start and stop ramps for smooth, efficient performance. One standard frame size covers all typical applications from 3–350 HP at 200-600 VAC. 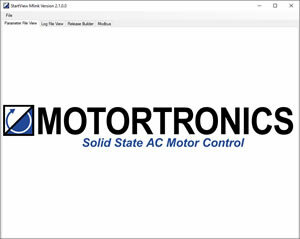 Protecting the motor and soft starter in the event of an overload condition at full I²t motor overload with intelligent thermal memory retention feature. Continually monitoring overloads to ascertain the reduction in motor heating levels even when VMX-agility™ is in the ‘off’ state. 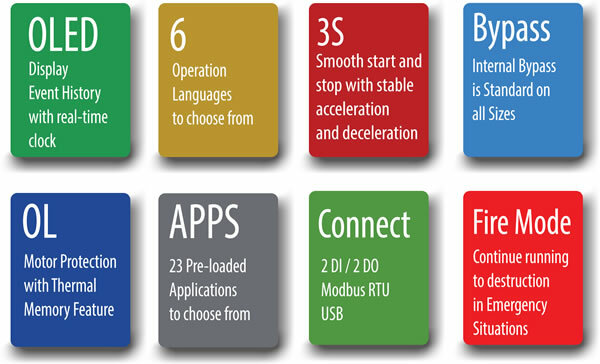 This is combined with protection and diagnostics giving the operator peace of mind while running the motor. VMX-agility™ life event logging is a unique feature that records the last 1600 events to enable fast accurate fault analysis and their resolution. Recording multiple activities including start, stop, top of ramp, faults, application parameters (time, overload level, currents, frequency) and the device information. Event log can be downloaded via USB port or via the VMX-agility commisioning software. Eliminate Water Hammer with Soft Stop Control. A gradual reduction in the output torque of your pump motor is provided when a stop signal is initiated. Check valves close gently and other fluid system components are no longer subjected to the shock and destructive potential of water hammer. Control Circuit: A standard 24 VDC control voltage supply with an optional power module which adapts the digital input voltage to accept a 110–230 VAC signal. Start Delay Feature: Intentional start delay allowing pump actuators to engage before start. Lower Panel Production Costs: The VMX-agility™ uses one common unit frame size across the voltage range of 200–600 VAC facilitating efficient panel layout and interconnections to reduce material and panel production time. Loss Reduction: The VMX-agility™ uses one common unit frame size across the voltage range of 200–600 VAC facilitating efficient panel layout and interconnections to reduce material and panel production time. Fire Mode: External input signal overriding normal controls allowing the motor to continue running in emergency situations. Number of Starts: Optional cooling fan for heavy duty applications with up to 40 starts per hour.